The bankers better beware. They will be dragged from their lofty towers and dragged onto the streets. This is NORMAL and it ALWAYS unfolds over and over again. You can cheat the people sometimes and get away with it, but you cannot cheat them day-in-and-day-out perpetually. There is a price for such conduct. It is called a riot. But for the video . . . The latest example of cellphone video vindicating someone from false charges is a doozy. It comes from Washington Parish, La., and WWL TV. NEW Servando ‘La Tuta’ Gomez, (left) a former grade-school teacher who taunted authorities and once led an organisation which wreaked havoc across the western state of Michoacan, was arrested on Friday. 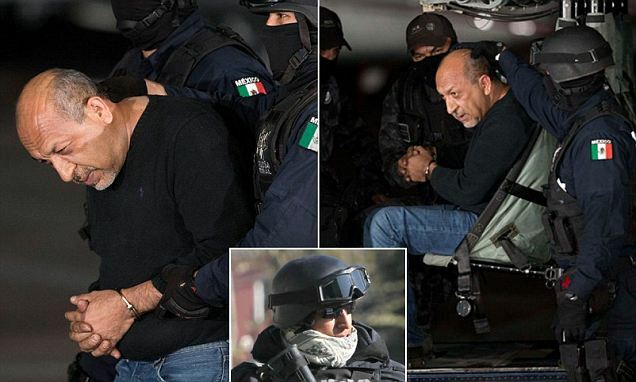 Authorities swooped in on the 49-year-old kingpin as he left a house in Morelia, the capital of Michoacan, along with eight bodyguards and associates, including is brother Flavio (bottom right) toting a grenade launcher, three grenades, an Uzi machine pistol and assault rifles, National Security Commissioner Monte Alejandro Rubido said. They were taken without a shot fired after a months-long intelligence stakeout, in which Gomez’s associates were identified when they gathered for his birthday February 6 with cakes, soft drinks and food.